The story is primarily a political thriller—there is little physical action and only a scene or two in which there might be some physical danger. Tiro is a wonderful, sympathetic character—intelligent, loyal, hard-working; brave when he needs to be; and, at all times, discreet. His “voice,” through Harris, is straightforward narrative with not a lot of reflection or poetry, but excellent descriptions of places and people—what you might expect from a person who spends his life listening, watching and recording. As Tiro states in the early pages, he probably spent more time with Cicero than anyone else, including Cicero’s family. The famous orator comes across as ambitious, politically astute and a ferocious master of detail. Cicero married for money, so he could enter the Senate, but was a loving husband and father, writing frequently about his children (daughter Tullia and son Marcus) and his fears for them. I liked his intelligent, abrasive wife Terentia, who on more than one occasion gave him the inspiration to do something unexpected. He stayed married to her long after he made enough money to fund his own ambitions and many people at the time wondered why he didn’t divorce her. As to the plot, if you don’t have some familiarity with the players and events of the times, it can become quite confusing. The action takes place between civil wars and dictatorships with a young Julius Caesar just starting to play a role in politics. Harris does a good job of weaving the historical details into the narrative without boring the reader, but it still helps to have some background. There are plots within plots, shifting factions and loyalties, and the minutia of governing. Cicero walks a fine line trying not to alienate the men in power while not becoming their pawn. He successfully prosecutes an “untouchable” aristocrat who plundered Sicily, adroitly advises Pompey in his transition from army to public life, and foils the ambitious plot of some of the most powerful men in Rome to steal an election. But with all his brilliance, he still makes enemies and, by the end, when he wins the imperium he so lusts for, they are lining up on all sides to take him down. Harris does us a favor bringing this famous Roman back to public notice in such an accessible story. Since Latin is no longer required in high school or college, Cicero is fading from our collective memory. Which is a shame—he profoundly affected our U.S. founding fathers. Because so many of his books and letters survived, his work became canon in studying the language and his views on a balanced government suffused the ideas of Enlightenment thinkers and are reflected in our constitution. John Adams’ first and most prized book was his Cicero. 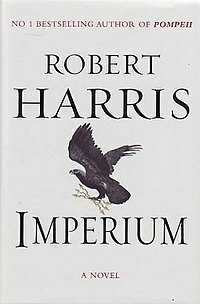 I recommend Imperium and will be looking forward to the next installment: Conspirata.